Posted by admin in Eyjafjöll, Iceland, volcano art, volcano culture, volcanoes. A little while ago we linked to the Eyjafjallajökull Art Project, a collection of artworks inspired by the 2010 eruption of Eyjafjallajökull volcano in Iceland. There’s some very good stuff there (along with some that is, er, not so good), but Claire Iris Schencke‘s work really stands out. 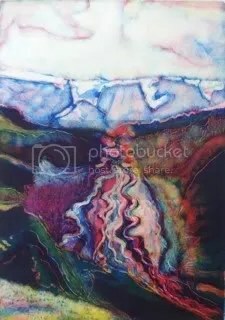 The artist has been in touch since I posted that link, and I’m very happy to say that some of her Eyjafjallajökull works will soon be showcased in a Saturday Volcano Art article, when that feature resumes publication later this month. Much more (and a nice link back to us) can be found on Claire Iris Schencke’s art blog. For the moment, and as a taster, here (with the permission of the artist) is Claire Iris Schencke’s ‘Monotype of the Krossá River’. The braided glacial river Krossá drains Eyjafjallajökull and Myrdalsjökull, feeding the Markarfljót which runs southward from the glaciers and which flooded during the eruption last month. More information about this picture can be found in a posting on the artist’s blog. Looks great, and is very informative. I am learning more about this seismic region every time I check your blog. More paintings to come!